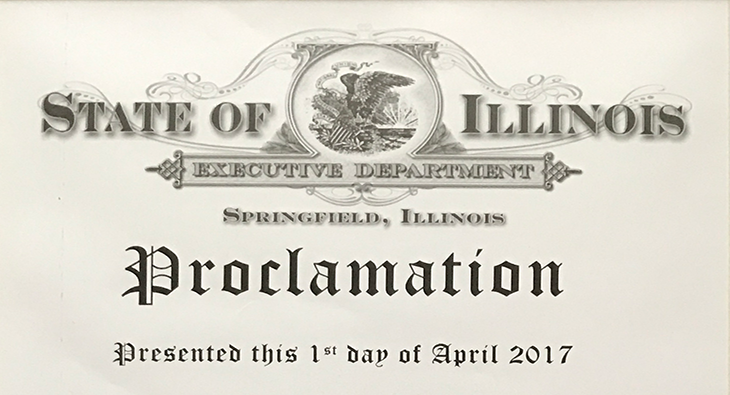 Barrington, Illinois, April 1, 2017– In a partnership with the Barrington History Museum, Joint Digital secured a Gubernatorial Proclamation recognizing the work done to further the historical narrative of the State of Illinois. 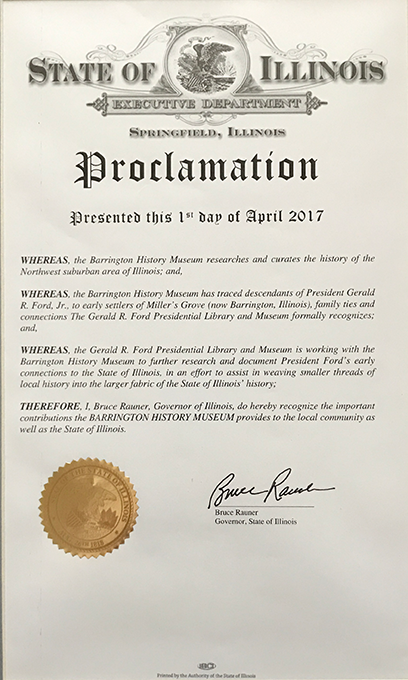 The proclamation specifically recognizes the work that the Barrington History Museum has done tracing the genealogy of President Gerald Ford to that of the Miller family (of Miller’s Grove). It was read and presented to Michael Harkins, of the Barrington History Museum on Saturday, April 1, 2017 at the history museum’s annual Presidential Lecture Series. This year the series honored President Gerald Ford by hosting a luncheon and presentation by Mr. Donald Hollaway, Curator of the Gerald Ford Presidential Museum and Library. Joint Digital is an instructional design consulting company that engages with clients on projects for compliance, internal communications, outside marketing, and client support and education. Joint Digital strives to address the needs of the client while being an advocate for the learner. The Barrington History Museum’s Mission – keeping history alive through preservation and education. This includes the collection, preservation, documentation and exhibit of Barrington history and to provide specialized education programs from pre-school through adult. If you would like more information about this topic, please contact Matthew Ensenberger at 630.308.4530 or email at matt@jointdigital.com. Download a .PDF version of this release.